Speaking of History...: Day 11 - Doctoral Graduation - Mission Accomplished! Day 11 - Doctoral Graduation - Mission Accomplished! Today's activities are not directly related to my work at a Mount Vernon Life Guard Fellow but since it is happening during my fellowship I thought I would also share on this blog. Six years ago I began to work on my Ed.D from Walden University in Teacher Leadership. I completed my dissertation this past spring and the graduation ceremony coincidently was scheduled for July 11 in National Harbor, Maryland - just minutes from Mount Vernon. 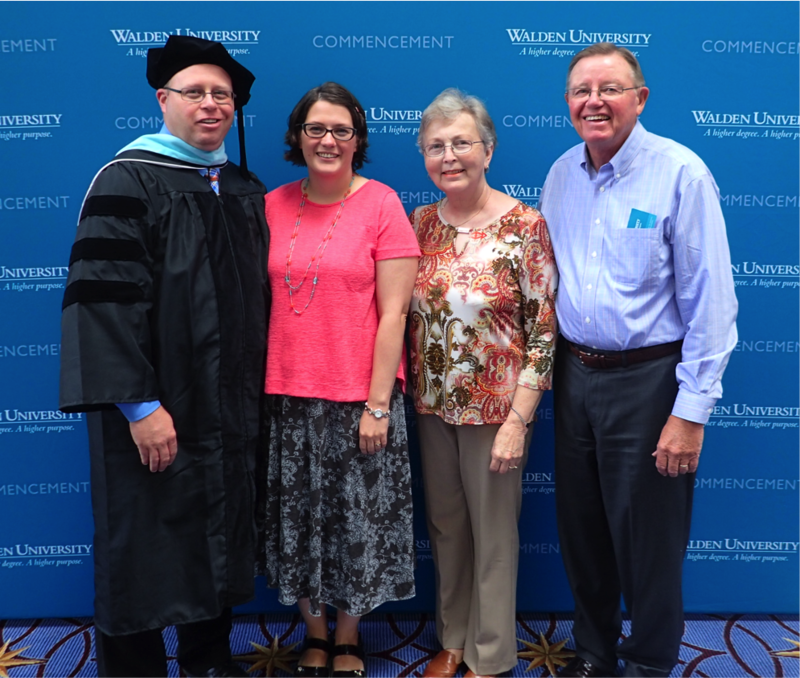 My wife and parents flew in to attend my graduation so that is the plan for today - attend graduation. 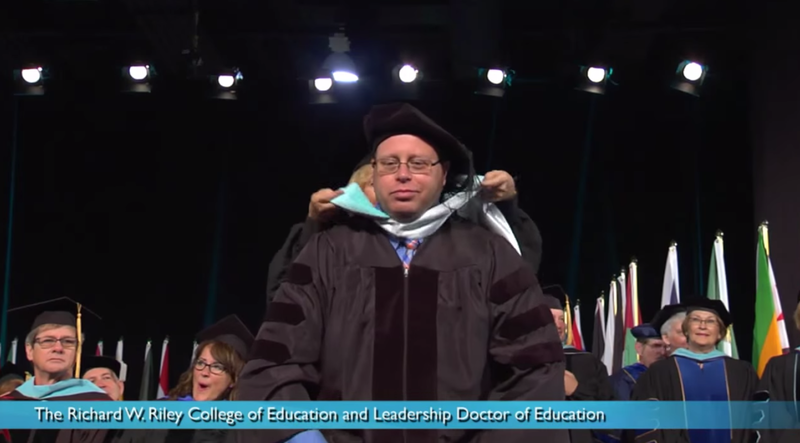 As a doctoral graduate I participated in the hooding ceremony which took place earlier in the day. All of the Walden graduation ceremonies were held at the Gaylord National Convention Center. I registered, put on my regalia and then took my assigned seat awaiting the start of the ceremony. Jayme and my parents were seated a section over in front of the stage. As we waited in our seats for the start of the ceremony we talked about the struggles we faced the path we all took to reach this point. To be honest I found it a little overwhelming as I sat there. The convention center was playing some music over the speakers on stage and one of my favorite songs started, "Don't Stop Believing" by Journey. It all felt a little surreal. Before I knew it everyone in my row stood up and we walked up to the stage to be hooded. I held my hood in my hand and as my name was read the hood was placed over my head. 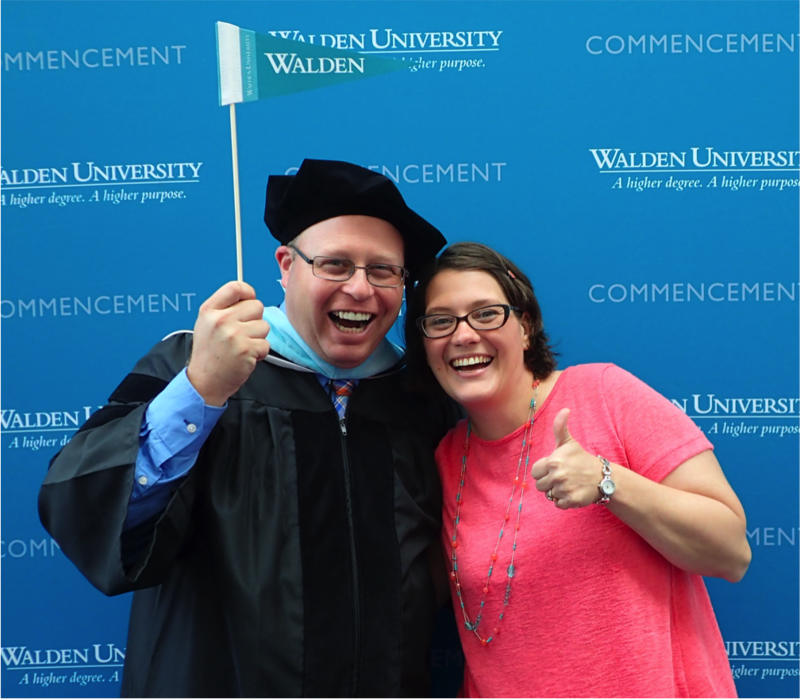 Walden recorded the hooding ceremony and it is available on YouTube. If you are interested in seeing the five seconds it took to call my name and place the hood over my head check out the video below at 33:45. It was a satisfying feeling and even though I had completed my work for the degree a couple of months earlier it was a great way to formally end my doctoral journey and I was so happy that family was there to help me celebrate. A lot of people helped me get here and it was gratifying to have some of them here today. After the ceremony we took some pictures, grabbed a coffee and explored the National Harbor area a little. I have been fascinated by the sculpture "Awakening" since seeing it the movie "The Net". 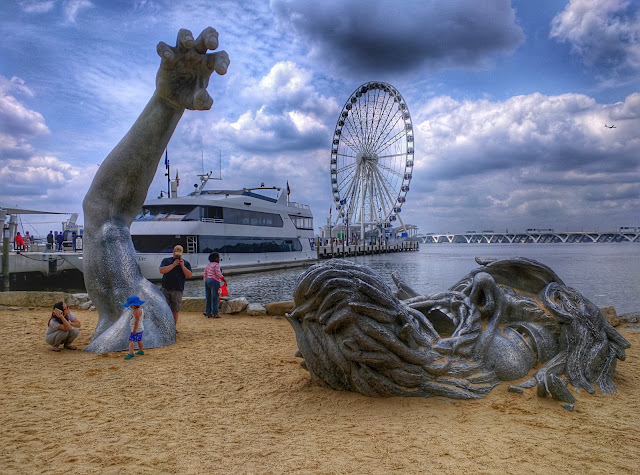 It was removed from Hains Point to National Harbor in 2007. I took a couple of pictures of Awakening before heading back to Mount Vernon. We went back to Mount Vernon where we toured the library and ate a meal at the Mount Vernon Inn which my dad described as "the best meal I have ever had". Good day. Tomorrow I get to share Mount Vernon with my family. My mom and dad have never been to Mount Vernon so I can't wait to show them the mansion and the grounds.